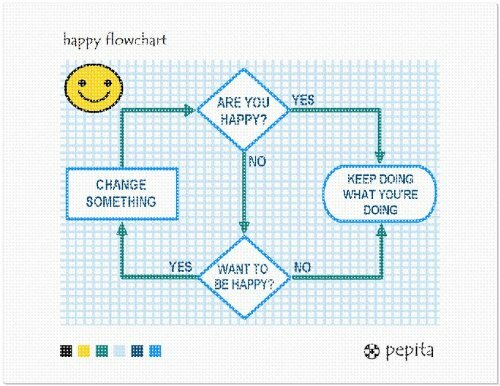 A flowchart of the paths one takes to find happiness in life. Pepita Needlepoint printed needlepoint canvas is fun for every level of stitcher, from beginner through advanced. No need to follow complicated charts – the design is printed in full color, right on the canvas. The 100% cotton canvas is durable, easy on the hands, and stitches up quickly at 13 threads per inch. Thread is NOT included. Can be used with Pearl Cotton, Tapestry Wool or Embroidery Floss. Printed in vivid color on 100% cotton Zweigart Mono Deluxe canvas. Stitchable area appr. 10 x 7 inches. Stitch count appr. 11,830. Canvas only. Thread is not included.